We’ve all used the “carrot and stick” analogy at some point or another. Whether you’re a leader in ministry or the marketplace, whether you’re a paid professional or a parent, you have likely tried to assess the right times for leading with rewards vs. driving by rules. But which times call for which method? When you can. Seriously. Whenever…you…can. Tempted to use a stick? Back up and grab some motivation. Want to throw down some rules? Take a deep breath and figure out the more positive ways to communicate what you need. It takes little energy to draft up a do’s and don’t’s list and rule with control. But leading by influence? That’s a different thing altogether. When it’s new. You need to determine how to make people want to follow the latest initiative. Help them to clearly see the why behind whatever you’re asking them to do. Paint a clear and compelling vision, and watch your team come alive. When they’re weary. Maybe your team has been through a difficult season. Maybe you don’t need to lead with a carrot at all. Maybe you just rip the carrot off the string and hand it to them, free of charge. Use the right opportunity to communicate the right message: I care about this team more than I care about that task. When accountability is needed. Accountability doesn’t have to be a negative word. I’ll admit: I’m the world’s worst procrastinator. There are days when I know I’m just not going to get x done unless I employ the help of a friend: “Hey, at 5:00, ask me if I finished this project.” Those few words are usually what I need to keep me on the ball for much of the day. The “stick” doesn’t have to be a rod of punishment. It can be a method of motivation if both you and your team understand it’s purpose. When you must. There are times it’s necessary. And usually you know those times. It comes after clear vision and direction has been given, adequate time has passed, follow up conversations have happened, and no results have come. I have a friend who was having trouble getting his direct reports to send in some weekly reporting numbers. Week after week, he tried to lead with a carrot, but a few months in, he realized that simple vision wasn’t working. So he tried a different approach. He said something to the effect of, “You can do this job, or you can find a new job. Try me if you think I’m kidding.” Spoiler alert: no one was ever late with their numbers again. As leaders, it’s our job to know what inspires our teams to do their best work. It should be our goal to lead them to recognize and respond to the way that God has shaped them. 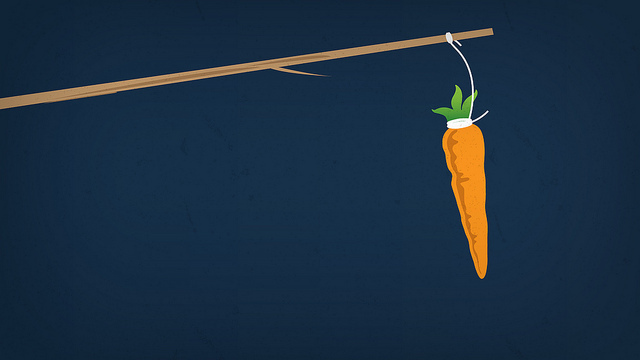 What are your most effective uses of the carrot and stick?